Help Us Bring Clean Water To The World! At the end of January, the Hubs and I signed up for our first 5K together which is slated for May 4th. We’re running with Team Samaritan’s Purse to raise money for water projects in developing countries. I’m no runner, but I figured by May I could be, especially if it helps other people. That’s where you come in! Would you please help us spread the word about this incredible mission and even consider donating a couple bucks? If you gave a buck a K, that’d be $5 and a very welcome donation indeed. Only $5… and two seconds of time. Will you help? 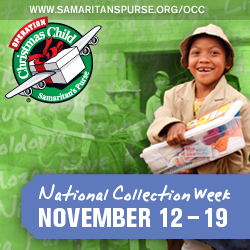 Want to know what kind of water projects Samaritan’s Purse does? Here’s a great video for an example of some things they’ve done in Haiti and beneath it is a personal story of a woman in Cambodia whose life changed because of a well (though ignore the end about collecting donations the way they suggest. We no longer run the program that way). Some of the things we do are build wells and latrines, teach hygiene classes, and even truck in clean water to certain areas. Clean water changes lives and entire communities. The impact it has on their health is incredible. I figured this would be a fun and healthy thing for us to do as a couple too, so we’re giving it a go. Unfortunately with the ups and down of Boone weather and snow and ice, we haven’t been able to train (though I think our elliptical is an okay substitute). My cousin recommended the app Couch 2 5k, so maybe I’ll give that a go. Any runners out there have tips for us? I definitely recommend the couch to 5k app. Before I started it, I could barely run for 2 minutes without stopping. Now I can run for 30 min without stopping in just 8 weeks. It’s awesome. Also get yourself some good running shoes. Normal tennis won’t do. I really like Asics personally.